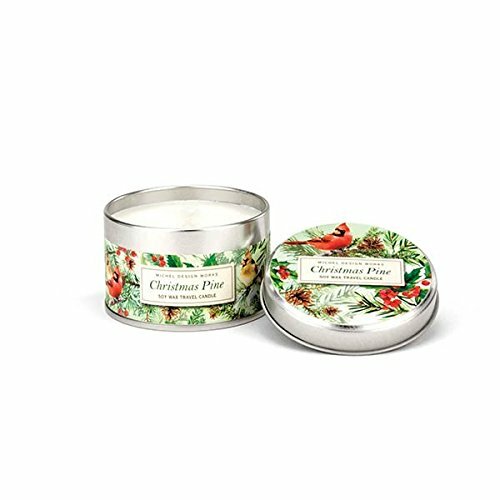 Michel Design Works Scented Soy Wax Candle, Christmas Pine, Travel Tin Size by Michel Design Works at Wow In The Details. MPN: CANT293. Hurry! Limited time offer. Offer valid only while supplies last. Michel Design Works handmade, all-natural candles are 100Percent soy wax - a renewable resource that's nontoxic, biodegradable and clean burning. Michel Design Works handmade, all-natural candles are 100Percent soy wax - a renewable resource that's nontoxic, biodegradable and clean burning. These handy lightweight candles move easily from room to room and outdoors to a deck or patio too. Slip these elegantly designed tins into your luggage to add a special touch of home to your trip. Michel Design Works candles are available in 3 sizes: travel tin, 6.5-Ounce and 14-ounce. Michel Design Works was created by Bruce & Deborah Michel in the early 1980s. The first product was an elaborate "memory book" called our country diary. Still a favorite today, it is filled with vintage artwork, quirky quotes, notable dates and plenty of room to record all the events of the year. Our country diary will become a beautiful record of your family life. When they first created their signature elephant logo, it signified a remembrance of all things special. Although Michel Design Works has greatly expanded into bath & body, home fragrance and decor, when Bruce & Deborah remember and celebrate all of their wonderful customers and the company's history, it is even more fitting today! whether you are a new or a long-time friend, we welcome you to enjoy the art, Lather up with our English soaps, set an elegant table with napkins, candles, Plates, and serveware, and end your day with wonderfully fragrant bubble bath.